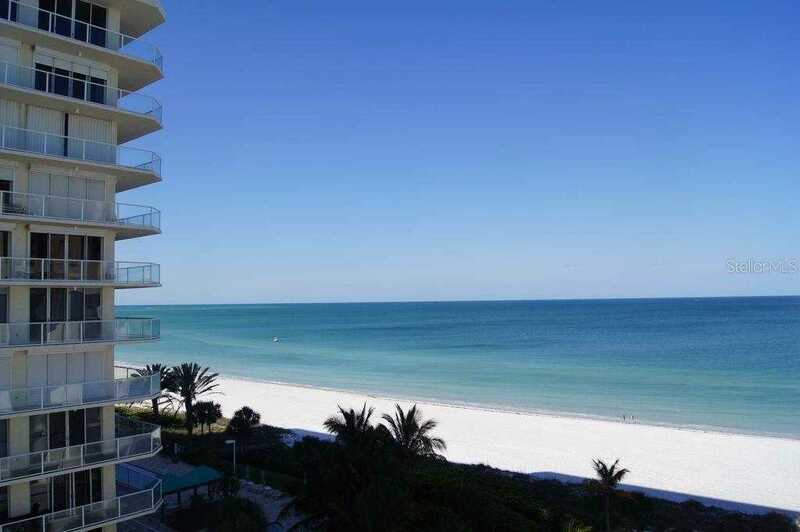 Lido Key Penthouse with Outstanding Direct Gulf/Bay Views. This spacious one bedroom penthouse on the 7th floor with large 4 piece bath, sleeps six is located directly on the Gulf of Mexico. Rental income approximately $22,000 per year. This unit offers granite countertops and breakfast bar in both the kitchen and between the kitchen and dining area, living-dining room combination with beautiful ocean views. Walk in front door and see immediate gulf views. Completely refinished and fully painted in 2016. One of the best features is the covered lanai (125 sq ft) with retractable sliders that takes in wonderful beach views as well as views of Sarasota Bay. This unit is one of only 42 residences in a well-maintained building complete with elevator service and open walkways. Secure, under-building parking, a large heated pool, clubhouse with kitchen, lounge area, bathrooms and outdoor BBQ steps from waters edge. Minutes from famous St. Armands Circle and the unique shops and desirable restaurants. Ten minutes to the ever popular downtown Sarasota with theatre and restaurants. We love that you can walk or bike to the elegant shopping and dining of St. Armand’s circle or walk to South Lido Park and spend the day kayaking or fishing. Also enjoy walking on the beach, seeing the sun rise and set, taking leisurely swims in the heated pool that overlooks the Gulf. Just steps away from the Ritz Carlton and the L’Elgance residences. Please, send me more information on this property: MLS# U8027081 – $469,900 – 1770 Benjamin Franklin Dr #704, Sarasota, FL 34236. I would like to schedule a showing appointment for this property: MLS# U8027081 – $469,900 – 1770 Benjamin Franklin Dr #704, Sarasota, FL 34236.